Kanye West has more albums out than I thought. Well, I hadn’t ever really thought about it but when I learned that My Beautiful Dark Twisted Fantasy is his fifth studio album I was a tad surprised. It should go without saying that I’m not familiar with Yeezy’s work. Nor am I familiar with why he’s, sometimes, called Yeezy. I have recently learned that yeezy is slang for some other stuff, too. Not sure which came first, the nickname or the other slang. I’ve lived happily my many years being oblivious to Kanye West’s music. I know him more as that guy that seems to have some feud with Taylor Swift for reasons that I’m not sure anyone really understand. Does Kanye even understand it? Idk. Also, I don’t care. I just watched him kidnap a bird lady and then take her to a dinner where bird was the main course. 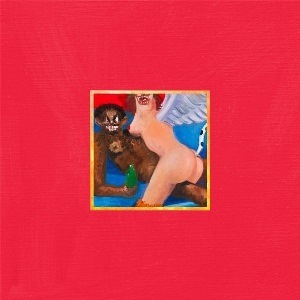 Bet you’re scratchin’ your head right now, thinking, “wut?” So, yeah, My Beautiful Dark Twisted Fantasy was released in 2010 after Kayne had several years rather public legal problems. I didn’t go looking for what those problems where because I don’t care. Apparently, he exiled himself to Hawaii. Really? Is that a thing? While there he worked on this album. He had a ton of guest appearances and high-profile producers come help. Wiki says that some critics noted its “maximalist aesthetic, opulent production quality, and dichotomous themes.” Sure. I get that. There is also a 34-ish minute long short film that features the music, and a bird lady. I watched it. So can you. Here. Apparently, the original cover art for the album caused a little stir to the point of being rejected by some stores. A quick look at it and you’ll notice why (both versions pictured below). I don’t know where the original was sold. iTunes currently has it blurred but maybe if you buy it, you get to see the art work. The album one a Grammy for Best Rap Album and was nominated for several others but no Album of the Year. This was seen as a snub by many critics and West was vocal about it. Turns out, I’ve heard at least two songs by Yeezy before: “Power” and “All of the Lights.” Although I didn’t hate the album, as I had secretly hoped, these two are probably my favorites. Might even download them.